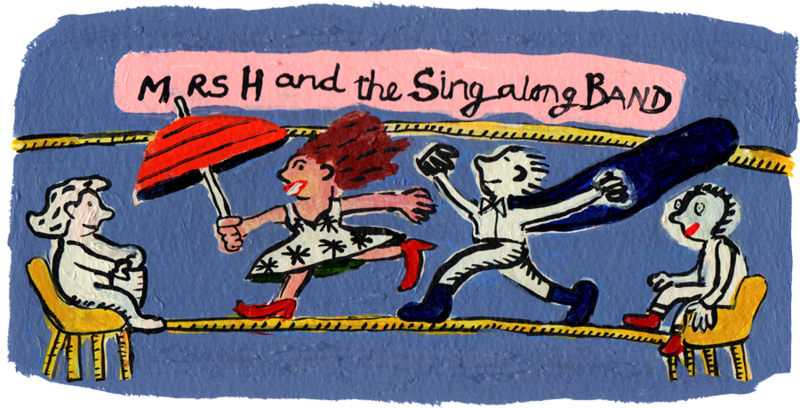 The Sing-along Band is a family phenomenon! We bring live music performed by professional musicians to families in a way that can be enjoyed by everyone, regardless of age, income or background. The six piece band consists of vocals, guitar, double bass, banjo, flute, accordion, drums, and trumpet. Performances last 45 minutes and include a range of handmade props, puppets and audience instruments. The band have adapted their performance to suit a range of different spaces (both indoor and outdoor) and audience sizes, from 20 to 1000 people. 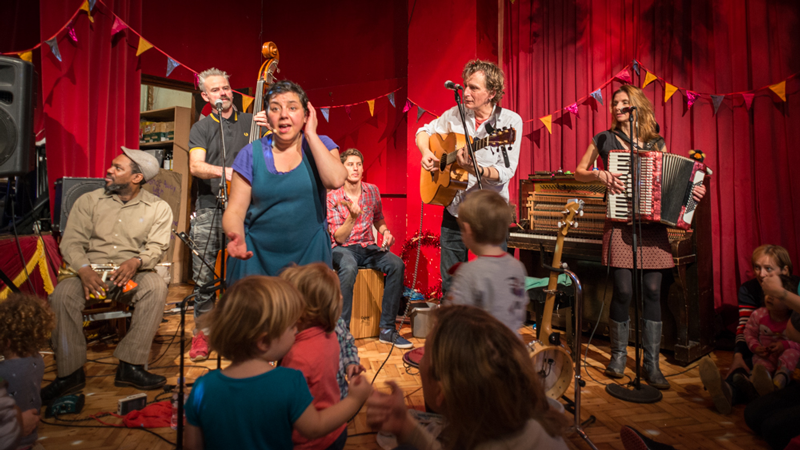 The Sing-along Band are all professional musicians with extensive experience performing at schools, community festivals, social centre's, libraries, nurseries, special needs schools, and elderly care groups, and other venues across London and nationwide. All members have full CRB checks. Free drop-in for children and their carers. April 10th - The Queen Elizabeth Hall Foyer, Southbank, London lunchtime concert. June 8th - River Thames Festival. Details to be announced. June 16th - The Quaterhouse Theatre, Outlands Festival. July 13th - Village Green Festival, Southend. July 19th - 21st - Latitude Festival, Suffolk. "What an amazing session! It was so much fun, interactive and surprising. Children were immersed in the tunes, singing their little hearts out. Thank you." "Fantastic! So much joy. So much fun! Lovely to see all the kids so engaged and enjoying themselves"
"Mummy, isn't it that sometimes music can make you feel so happy you want to cry?" "Now I've been going to sing-along over the course of seven years. It has been one of the most joyful and memorable experiences of parenting for me, and has helped to teach me how to have fun with (and laugh with, and dance with) my daughters. Barely a week goes by when one of Harriette's songs doesn't bring a tear to my eyes. I feel blessed to live so near to this remarkable phenomenon, and fervently hope sing-along can continue so that other parents can be as lucky as I have been." "I hope to come again really soon, we had all the music and dancing and the laughs with you"
"It's priceless seeing the expressions on people's faces. I like the fact that you got everybody up and dancing. Movement and exercise and all the little children, inter-generational stuff was really lovely". "The children really engaged in the original material and have since been heard singing the songs together in the playground, a real and true endorsement"
"As a non-musical person I feel coming to the sessions has enabled a (kind of) musicality in me that I in turn can pass on. In short, the impact on coming to the sessions has been immense on us both – I have no doubt that my sons confidence, musicality and ability to improvise and play has been in part inspired by Mrs H and the Singalong Band." "Mrs H and the Sing-along Band are part of my sons DNA, every word and every note is in his heart"